The first things that come to mind when you think about Halloween are probably candy, little kids in costumes, and pumpkins not koozies. 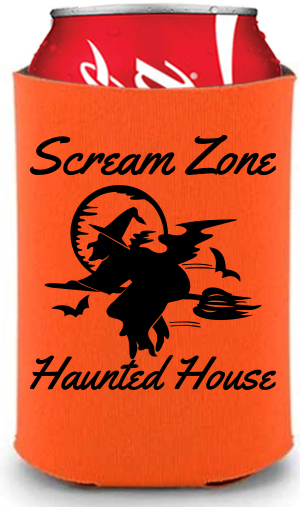 Halloween Koozies designed onlineBut Halloween is an adult holiday as well. In fact, the National Retail Federation says that Americans will spend a total of $7.4 billion dollars on Halloween-related items this year, making it the second-most expensive US holiday of the year (behind Christmas, of course). The group projects that more than 67% of Americans will buy Halloween costumes in 2014, and those costumes aren’t all for kids. They’re for adults, too – adults who are going to Halloween parties and will be consuming adult beverages while they’re there. That’s where our items such as custom imprinted koozies and can coolers enter the picture. Some Halloween parties are just for family and friends, while others are big blowouts where tickets can cost as much as $100 each. Either way, the perfect, inexpensive way to dress up any Halloween bash is by including Halloween-themed custom koozies, stadium cups or bottle coolers in your plans. Express Imprint makes it simple to design your own Halloween koozies online, in just a few minutes. We have nearly a dozen different holiday-themed graphics you can add to your coolers, such as witches on broomsticks, pumpkins, black cats, bats, haunted mansions or ghosts. Choose your colors (we’d suggest black or orange for Halloween, of course), add your own custom graphics so people will remember where the coolers came from once they go home, and you’re all set. Not only will these be a colorful and playful addition to your party’s décor, they’ll be the perfect souvenir or party favor for your guests. Everyone uses koozies - in the backyard, at the beach, at the stadium – so they’ll be remembering the fun time they had for years to come. If you’re running a sponsored Halloween party for paying guests or clients, it’s the perfect way to send the sponsor’s message home with the invitees. And if you have a bar or restaurant at which you’ll be hosting a huge bash, what better way to promote your business than with fun, attractive coolers which will have your bar’s name prominently featured? There are other great uses for the Promotional koozies and can coolers during the Halloween season, too. If you have a business in a shopping center which encourages youngsters to trick-or-treat in a safe environment, why not hand out your treats (or healthy alternatives, like a bottle of water) in a decorated Halloween cooler with your store’s name and logo on it? The kids will keep the candy and their parents will keep the koozie imprinted with your store’s information. Salespeople are always looking for a different excuse to get face-to-face time with clients or potential clients. A great excuse to “say hello” could be a personal delivery of a little holiday “goodie bag” of upscale candy or crackers, along with a bottle of hard apple cider in a Halloween-themed bottle cooler imprinted with a black cat and your company’s name. Finally, if you run a Pumpkin Patch or haunted house at Halloween, you shouldn’t even think of being without an ample supply of holiday koozies. Just build the cost into your admission price, give them out to all of your visitors, and they’ll have a great reminder to come back again next Halloween.